If you have many Free Text Invoices then adding them manually can be a cumbersome task and therefore, there is a need for automation. 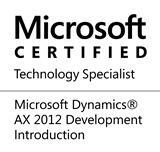 Dynamics AX is a powerful ERP and highly customizable so we can utilize that feature of AX. In this post, I will tell you how you can import multiple Free Text Invoices from Excel using X++. Lets say we have an excel file with Customer Account, Invoice account, Main account, default dimensions, item code, quantity and the price. We have to create a record in CustInvoiceTable and it’s lines record in custInvoiceLine table. We need to add a defaultdimension recid in custInvoiceTable. In order to do that we need to create ledgerdimention record first. The default dimensions in our case are Department, Cost Center and Product Category. The default dimensions are for each line item and so it can be different for each line item or could be same. But we have to create the default dimensions record first and then insert that default dimension record into custInvoinceLine table field ‘defaultdimension’.